Oh dear… I mean, oh dear… Let’s get this review out of the way. I quite enjoyed the first Cars film, in fact I have it on DVD, it was a heart warming story about what’s important in life (and not simply winning) and had likeable, quirky characters, a beginning, middle and end. Cars 2… has none of these. Mater the tow truck is invited to aid racecar Lightning McQueen as he takes part in the World Grand Prix, but upon making a fool of himself Mater is shunned, only to be mistaken as an undercover spy by two covert agents working to reveal a diabolical fuel conspiracy. I had hopes, with John Turturro, Eddie Izzard and Michael Caine supplying new voices (and they certainly do their best) but what I got was a messy and divided movie that shuns virtually ALL of the original quirky cast and replaces them with underdeveloped spy movie stereotypes. Plus Mater. Mater who has apparently broken the bonds of quirkiness to become downright aggravating to almost Jar Jar levels. Not to mention the two professional spies couldn’t tell Mater wasn’t a spy, somehow his bumbling idiocy was mistaken for just really good acting. Yeeeeah. I know it is a kids movie, a cartoon, but there were so many plot inconsistencies and vapid humour here; Pixar has shown time and time again that they can marry both childhood fantasy and mature storytelling, but not here. It seems unfair to slam Pixar as soon as they drop the ball, but it is so blatantly obvious here; none of it feels clever, the only bit I liked was the brief shot of little biplane pigeons at the French Grand Prix. That made me chuckle. 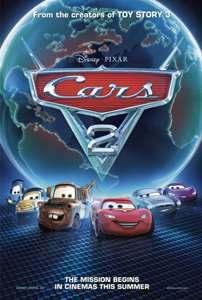 It had no purpose, the Cars universe was probably the last of Pixar’s creations in need of expanding. The nice “Radiator Springs” characters are ignored completely, the plot is stupid, and there was no message or morality suitable for a Pixar feature film (or even a Saturday morning cartoon). It’s just a big marketing scheme to sell lots of toys.